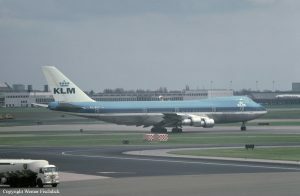 40 years ago today, KLM Flight 4805 (PH-BUF) was a scheduled passenger flight from Amsterdam Schiphol Airport, Netherlands to Las Palmas de Gran Canaria Airport, Canary Islands. The Boeing 747-206B named Rijn (Rhine) was carrying 234 passengers & 14 crew members. PH-BUF, the accident aircraft involved. 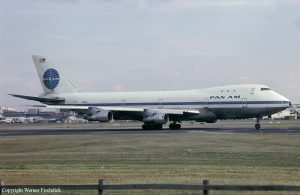 The second aircraft involved, Pan American World Airways Flight 1736 (N736PA) was a scheduled passenger flight from Los Angeles International Airport to Las Palmas de Gran Canaria Airport, Canary Islands. The Boeing 747-121 named Clipper Victor was carrying 380 passengers & 16 crew members. N736PA, the accident aircraft involved. The cockpit crew of KLM Flight 4805 consisted of Captain Jacob Veldhuyzen van Zanten, First Officer Klaas Meurs, and Flight Engineer Willem Schreuder. 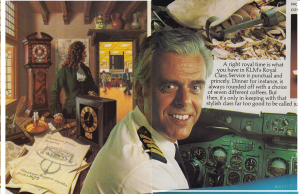 Captain van Zanten was KLM’s most experienced pilot. He was featured in an advertisement in the KLM magazine Holland Herald. The magazines with this ad inside were on board KLM Flight 4805. 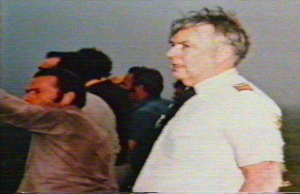 The cockpit crew of Pan Am Flight 1736 consisted of Captain Victor Grubbs, First Officer Robert Bragg and First Engineer George Warns. Seven years before this accident, N736PA was the first Boeing 747 to be hijacked. 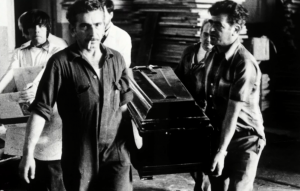 At 12:30 pm a bomb planted by the CIIM terrorists exploded in a florist shop at Las Palmas de Gran Canaria Airport. 8 people were injured. Members then threatened to explode a second bomb at the airport, forcing police to shut down ATC while they searched for the bomb. A large number of flights were diverted to Los Rodeos Airport including KLM Flight 4805 and Pan Am Flight 1736. The airport had only one runway and one major taxiway parallel to it, with four short taxiways connecting the two. KLM Flight 4805 & Pan Am Flight 1736 at Los Rodeos Airport shortly before the accident. While waiting for Las Palmas to reopen, the diverted aircraft took up so much space that they were parked on the long taxiway, meaning that it could not be used for taxiing. Instead, departing aircraft had to taxi along the runway to position themselves for takeoff, a procedure known as a runway backtrack. The KLM Flight 4805 passengers were transported to the airport terminal. While the Pan Am Flight 1736 passengers remained on board due to the terminal being full. Pan Am Flight 1736 passengers walked on the airstairs to stretch their legs. At 15:00, Las Palmas Airport reopened, passenger Robina van Lanschot of KLM Flight 4805, who lived on the island, chose not to re-board KLM Flight 4805. Since the Pan Am Flight 1736 passengers remained on board it was possible to leave Tenerife at once. The taxiways were congested by other aircraft. This meant the Pan Am crew had to backtrack on runway 12 and takeoff on runway 30. The entrance to runway 12 was blocked by KLM Flight 4805. The Pan Am Flight had to wait almost 2 hours for all KLM passengers (except 1) had reboarded & refueling had taken place. The KLM flight was then cleared to backtrack runway 12 and make an 180 degree turn at the end. 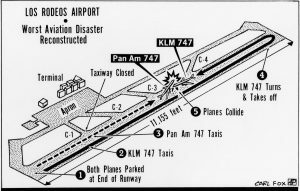 Three minutes later (at 17:02) Pan Am Flight 1736 was cleared to follow the KLM aircraft and backtrack runway 12. The Pan Am crew were told to leave the runway at the third taxiway and report leaving the runway. During taxi onto the runway, the weather deteriorated & a fog bank rolled onto the runway limiting visibility. At 17:05:44 KLM 4805 reported ready for takeoff and was given instructions for a Papa beacon departure. The KLM crew repeated the instructions and added “We are now at takeoff”. The brakes were released and KLM Flight 4805 started the takeoff roll. Tenerife tower, knowing that Pan Am Flight 1736 was still taxiing down the runway replied “OK …… Stand by for takeoff, I will call you.” This message coincided with the Pan Am crew’s transmission “No … uh we’re still taxiing down the runway, the Clipper 1736”. These communications caused a shrill noise in the KLM cockpit, lasting approx. 3.74 seconds. Tenerife tower replied: “Papa Alpha 1736 report runway clear.”, whereupon the PanAm crew replied: “OK, will report when we’re clear”. This caused some concerns with the KLM Flight engineer asking the captain: “Is he not clear then?” After repeating his question the captain answers emphatically: “Oh, yes”. Tenerife tower replied: “Papa Alpha 1736 report runway clear.”, whereupon the PanAm crew replied: “OK, will report when we’re clear”. This caused some concerns with the KLM Flight engineer asking the captain: “Is he not clear then?” After repeating his question the captain answers emphatically: “Oh, yes”. 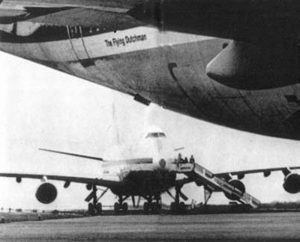 A number of second before impact, the KLM crew saw the Pan Am Boeing 747 still taxiing down the runway. The crew tried to climb away and became airborne after a 65 feet tail drag in an excessive rotation. The Pan Am crew immediately turned the aircraft to the left and applied full power. 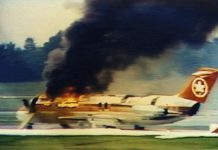 The KLM aircraft was airborne, but the fuselage skidded over the Pan Am’s aft fuselage, destroying it and shearing off the tail. The KLM aircraft flew on and crashed out of control 150 m further on, sliding another 300 m bursting into flames. Killing all 248 on the KLM aircraft. 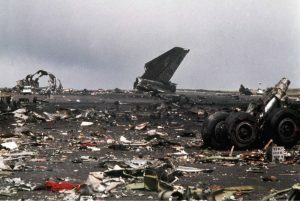 In total 583 passengers & crew lost their lives. Only 61 survived. 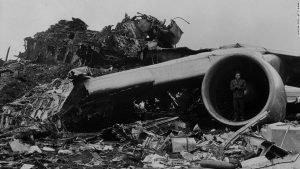 It is the deadliest aviation disaster in history. The accident was investigated by Spain’s Comisión de Investigación de Accidentes e Incidentes de Aviación Civil (CIAIAC) & assisted by the National Transportation Safety Board (NTSB). The probable cause was that Captain Veldhuyzen van Zanten took off without clearance. The investigators suggested the reason for this was a desire to leave as soon as possible in order to comply with KLM’s duty-time regulations, and before the weather deteriorated further. Interference from simultaneous radio transmissions, with the result, that it was difficult to hear the message. Use of ambiguous non-standard phrases by the KLM co-pilot (“We’re at take off”) and the Tenerife control tower (“OK”). 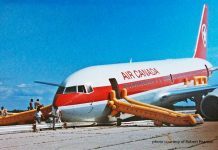 The Pan Am aircraft had not exited the runway at C-3. However, the angle of the third taxiway would have required the plane to perform a turn of approximately 148 degrees, which would lead back towards the still-crowded main apron. At the end of C-3, the Pan Am would have to make another 148-degree turn in order to continue taxiing towards the start of the runway. This would be extremely difficult for the Boeing 747 to do. Taxiway C-4 would only require two 35 degree turns. The airport was forced to accommodate a great number of large aircraft due to rerouting from a bomb threat, resulting in disruption of the normal use of taxiways. The Dutch authorities were reluctant to accept the Spanish report blaming the KLM captain for the accident. The Netherlands Department of Civil Aviation published a response that, while accepting that the KLM aircraft had taken off “prematurely”, argued that he alone should not be blamed for the “mutual misunderstanding” that occurred between the controller and the KLM crew, and that limitations of using radio as a means of communication should have been given greater consideration.